West Papua is the most important travel destination for marine tourism. Coral reef in Raja Ampat islands is considered as the richest for its bio-diversity. There are thousands of species of fish and other marine creatures that can be found in the region. We will meet you at the hotel where you stay in Sorong city and transfer you to a bridge where a traditional wooden boat is waiting for you. Transfer by traditional motorized wooden boat to Waigeo island. It takes approximately 2 hours to reach our destination. Arriving on the island, we need to put our bags at the homestay. Swimming and Snorkeling at Isanak beach. The coral reef is the natural habitat of a lot of species of fish such as anemonefish, striped surgeonfish, grouper, sweetlips, boxfish, lionfish, wrasse, goby, moorish idol, butterflyfish, and a lot more. We will go to Mamdifu river and stay for one night in the jungle. In late afternoon, before sunset, we can watch birds such as Papuan hornbill, Sulphur-crested Cockatoo, Palm Cockatoo, Pink-spotted Fruit-Dove. Overnight stay in tents in the jungle by the Mamdifu river. 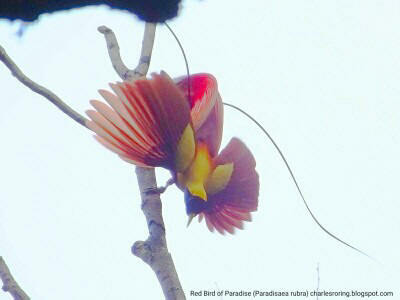 We will wake up early in the morning and go hiking to watch Red Bird of Paradise (Paradisaea rubra). 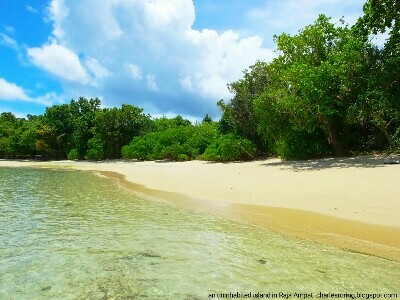 After breakfast, we will leave the village for Mamiaef island to enjoy fishing and snorkeling. However, if the water level is in low tide, we will visit tidal sandbar in the middle of the sea and then go to the island. We will wake up early in the morning at 05.00 and go to the jungle for birding. We will return and have a walking tour around the village. After lunch, we could revisit the lagoon to take pictures. We will leave Raja Ampat for Sorong city. Extended trip - Your tour in Raja Ampat could be extended to several more days in the islands. We could also provide tour to Klasow valley of Sorong regency or to Mount Mabowi of Arfak mountains where you could see wildlife in the jungle. There are several Indonesian airlines that connect Sorong city in the Province of West Papua with other cities in Indonesia. These airlines operate various kinds of airplanes that serve regular flights from Jakarta to Makassar and then to Sorong city. After arriving in Sorong city, visitors can continue their trip to Raja Ampat by speedboat, passenger ferry or liveaboard dive boats. Please, contact me (Charles Roring) by email to: peace4wp@gmail.com or by whatsapp to: +6281332245180.